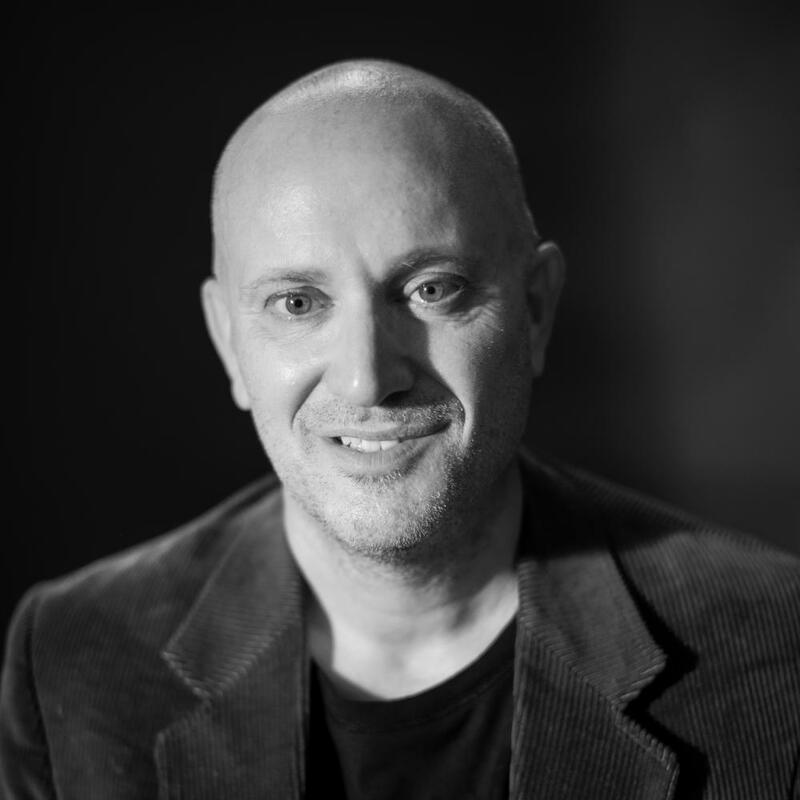 When Jeff Bezos purchased the Washington Post (or WaPo) for a reported $250 million in 2013, the reaction of most analysts was shock that one of the internet’s leading entrepreneurs would invest in a fading business. The 140-year-old paper had long been one of America’s most prestigious papers, and will long endure in the nation’s consciousness for its unearthing of what became the Watergate scandal in the 1970s. But like many news publications, it was unable to change with the times as consumers devoured more news, and content, online. One could say that no other news site is as rich in a diverse array of content, other than the UK’s left-wing Guardian. In contrast to the Guardian, which repeatedly lectures us that everything we do is wrong – from the use of emojis to dating tactics – the Post is far less strident in tone and quite frankly, is far more of a joy to read. And unlike the Guardian, the Post will run content from columnists who are to the right of Bernie Sanders – as in centrist political observer Chris Cillizza before he recently left for CNN and conservative political analyst Jennifer Rubin. On the energy and environment front, the Post is also a leader; we at 3p are quick to mine its content, as it now regularly issues lengthy and detailed investigative reports that are on par with Bloomberg or the New York Times. Investigative journalism is not yet quite dead, and Bezos and the Post deserve plenty of kudos for resuscitating a craft that currently few media companies are willing, or able, to fund. So imagine our surprise yesterday when we noticed that the newspaper’s daily Energy 202 email newsletter was sponsored by . . . the Koch Brothers. The banner ad at the top of the email was a jolt, considering the Post has been guarded, and often critical, about the Koch brothers’ influence on American politics as well as the tactics they have adopted to further their agenda. Plenty of articles in the newspaper’s archives outline their funding of non-profits and academia in order to advance their cause, which broadly defined is limited government and personal freedom. In fairness, the Post has also suggested that the Koch brothers will be behind conservatives’ resistance to some of the Trump Administration’s goals, although in reality both agendas offer plenty of alignment. Nevertheless, the newspaper’s reporters have made it clear where they stand on the Koch’s brothers’ influence in American politics. “Simply put, the Koch network is a GOP-aligned political effort like nothing we have seen, including operations such as the Club for Growth and Americans for Tax Reform that also aspire to sharply reduce taxes, government spending and regulations,” concluded one Post article in February 2016. To the Koch brother’s critics, their groups’ determination to roll back any progress on environmental remediation or clean energy deployment is clear. The Club for Growth, for example, applauded the White House’s imminent decision to withdraw from the Paris Agreement. “All cost and no benefit,” is what COP21 is about, says Americans for Tax Reform on its web site. Of course, clicking on that banner ad in the Energy 202 newsletter shows a far different story. 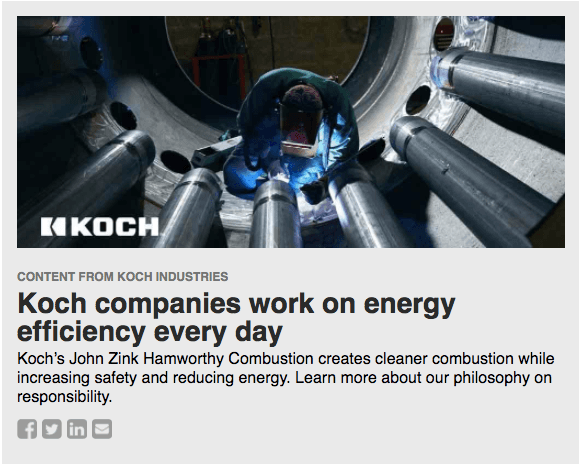 The banner takes you to Koch Industries’ corporate responsibility web site, which touts the company’s environmental awards, including its 2017 Environmental Protection Agency (EPA) 2017 prize as Energy Star partner of the year. Meanwhile, the Post has not been shy about covering the Koch brother’s stance on the EPA – witness its reporting earlier this year of their ties to the current head of the EPA, Scott Pruitt. So why would the Post accept advertising from an organization that clearly aims to mislead readers on its approach towards environmental stewardship, clean energy and a low-carbon economy? 3p contacted the Post to find out why; as of press time, the newspaper has not yet responded to our request for comment.